This fantastic book summarizes the most important events in Christian history from the time of Jesus to today in 12 easy chapters. This bestselling book presents key events and people every Christian should know, time lines, worksheets, websites, photos, maps and illustrations. The study guide in the back makes this book an excellent study for any group, including new believers' classes. It also tackles topics popularized by today's media: the reliability of the Bible, the accurate transmission of the biblical text throughout time, and sensationalized attacks on the Gospels. 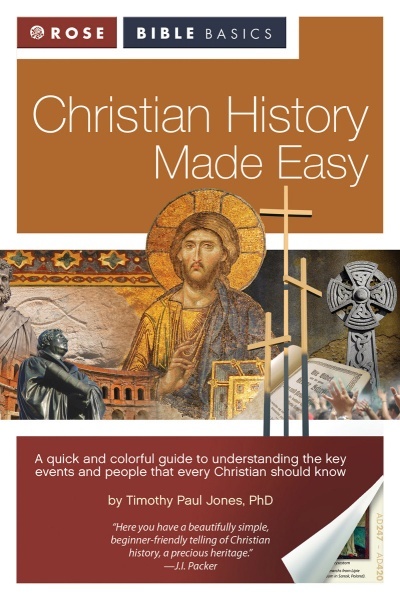 Theologian J. I. Packer says that Christian History Made Easy is, "...a beautifully simple, beginner-friendly telling of Christian history, a precious heritage." What do you know about Christian history? Here's your chance to test yourself, or to launch a 13 week study on the book Christian History Made Easy. The book contains a study guide with notes that add to the chapters. Author Timothy Paul Jones, Ph.D., makes Christian history refreshingly fun while at the same time informing believers about the history of the Christian faith.